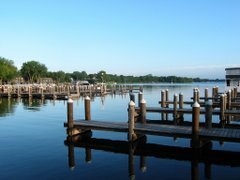 The Lake Minnetonka Association is dedicated to the sound environmental management and protection of Lake Minnetonka. As I outlined in last month’s column, there is a lack of a clear vision for protection and management of our lake. Here and in the next several columns, I want to articulate the Lake Minnetonka Association’s vision for Lake Minnetonka in several critical areas. Future columns will address protection from zebra mussels and other new invasive plants, animals and viruses and a comprehensive approach for shoreland and nearshore protection and management. This column presents our vision for managing milfoil in Lake Minnetonka. Our vision for milfoil management is to expand a long-term comprehensive restoration program throughout the lake. Milfoil has been managed primarily through the harvesting program of the Lake Minnetonka Conservation District. This program, established in 1989, harvests (or cuts) and removes milfoil in targeted areas around the lake. While the program is managed and administered effectively; there are limitations to what harvesting can accomplish. Stakeholders from three bays (Carmans, Grays and Phelps) had these views regarding the harvesting program: only 16% of respondents thought the harvesting program was effective and 76% thought it is short-term, small-scale or ineffective. In addition, the number of acres harvested has decreased by 100% since 1989. In 2007, only 323 acres were harvested. New science is now available that offers advantages in the ability to actually restore native plants while controlling milfoil. The use of herbicides, as has been proposed for Carmans, Grays and Phelps Bays in 2008, is safe and restorative. The Lake Minnetonka Association believes the harvesting program should be phased out and replaced with a program that is restorative and will treat much larger areas of the lake. Selective herbicides are safe and a restorative. Selective herbicides will actually control milfoil over large areas and for multiple seasons. Selective herbicides are applied early in the season and their use will diminish over time. There are no capital investments. Significant reductions in lakeshore cleanup are expected. Another significant advantage is that larger areas of milfoil can be controlled within the same budget as is now available for the harvesting program. Our analysis indicates the number of acres of milfoil controlled could increase by five-fold within the same operating budget for the harvesting program. We propose involving lakeshore owners as private funding partners in this program, because they have demonstrated a willingness to help protect this public lake.